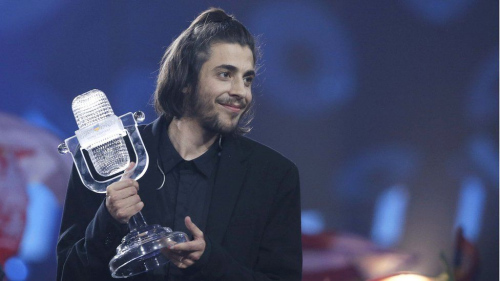 A series of "firsts" continued for Portugal, with Salvador Sobral's Eurovision Song Contest win over the weekend in Kiev, Ukraine. Before Saturday, the best Portugal had done in the popular singing competition was sixth place. That was back in 1996. Portugal first took part in Eurovision in 1964. Sobral's song Amar Pelos Dois translates into English as "Love for Both of Us." The song was written by his sister, Luisa, who joined him on stage for a final performance after he won the contest. Sobral won the competition by 143 points. He finished ahead of Kristian Kostov of Bulgaria. His song was "Beautiful Mess." When Sobral returned to Lisbon on Sunday, he told reporters he was happy his song won. "I hope the gala stops being a popularity contest," he said. Most years, the Eurovision contest winners have used electronic instruments, glamorous costumes, back-up dancers and even fireworks. Sobral's quiet love song, however, was backed by string instruments and a piano. "Music is not fireworks, music is feeling," Sobral said when he accepted the award. The Prime Minister of Portugal praised Sobral's performance on Twitter. Antonio Costa wrote: "A page of history has been written in Portuguese this evening at Eurovision. Bravo, Salvador. Bravo, Portugal." Sobral's victory is the latest piece of good news for the country. Last summer, Cristiano Ronaldo and the Portuguese soccer team won its first-ever European championship. And experts say that Portugal's economy is getting stronger, following a financial crisis that resulted in a bailout by the International Monetary Fund and the European Commission. And now, thanks to Sobral's victory, Lisbon will host the 2018 Eurovision Song Contest. Sobral said he does not want to be seen as a hero, just as a musician. "I'm not a hero," he said. "That's Cristiano Ronaldo." This financial crisis had a much greater impact on Main Street. The speech has resulted in a firestorm of controversy. The powers of the European Commission to regulate competition are increasing. Three-quarters of the country's workers took part in the strike. 1.Sobral said he does not want to be seen as a hero, just as a musician. He said that the deal should not be seen as a precursor to a merger. Aren't you afraid of being seen as a righteous crusader? 2.A series of "firsts" continued for Portugal, with Salvador Sobral's Eurovision Song Contest win over the weekend in Kiev, Ukraine.